The New Forest Association are pleased that the Forestry Commission are implementing a “Look, Don’t Pick” rule regarding fungi foraging on the New Forest Site of Special Scientific Interest under their stewardship. This affirms the protection our habitat deserves. This is consistent with their obligations to the protections of the SSSI, their management of the New Forest SSSI as a National Nature Reserve and their powers to authorise or deny picking of fungi under consent from Natural England. This brings the FC policy in line with the ban on fungi foraging on the Commons the National Trust, and the Nature Reserves the Wildlife Trust manage within the Forest. We hope that enforcement may be hard hitting on pickers taking undue advantage of the forest whether commercial or not. Enforcement may also be soft and educational for casual foragers. The message is the same, this is a protected habitat and landscape, leave the fungi to nature and the autumn display for all to see. It brings the FC back in line with the guidance 1998 Wild Mushroom Pickers Code of Conduct, the misreading of which was the source of the arbitrary 1.5 kg “limit”, which has absolutely no basis in law. The code clearly meant the limit for undesignated habitats, not SSSI or National Nature Reserves. An allowance should never have been implemented at all in this protected habitat. In July 2015 the NFA launched its campaign for a very specific ban on fungi harvest from the SSSI on the Crown Lands of the New Forest. In doing this we’ve sought to bring about best practice under existing laws, byelaws and guidance. After careful consideration we decided that calling for an Epping Forest style ban was the most clear cut solution, with its obvious precedent. We’re taking the precautionary principle that on a SSSI, especially one including fungi amongst its notified features, under heavy pressure from recreation and other use, that the fungi should be protected, part and parcel with the whole of this habitat. The NFA campaigns for the habitat and heritage of the Forest. In entering into this campaign we consulted with our own ecologists and local mycologists. We’ve consulted with and had support from the British Mycological Society, the Fungi Conservation Trust, Natural England, Buglife, Plantlife and the National Trust, the Hampshire and Isle of Wight Wildlife Trust (the latter two had already banned fungi foraging on SSSI land they manage). The fruiting bodies of the fungi are not merely food for other fauna, but are depended upon by at least 600 species of invertebrate using them as micro-habitats to fulfill their life cycles. The New Forest Site of Special Scientific Interest is in one of the most densely populated National Parks, surrounded on many sides by conurbation with insufficient alternative greenspace, and mounting recreation pressure. As open access land, it is easily accessible to all users, and an easy touch for volume foragers. SSSI is a designation that confers habitat protection under UK law. The New Forest is also a Special Protection Area (SPA) and a Special Area of Conservation (SAC), Natura 2000 designations or initiatives under EU law, and a National Nature Reserve. The Natural History Museum picked the New Forest as one of two biodiverse rich sites on which to base their ongoing climate change study. It is a gem, one of the crown jewels of natural biodiversity in Britain, Europe and the World. We ask all to understand importance of this ecosystem and the need for its protection, and that they respect its protection and find their fungi elsewhere. At September’s Verderers Court, the Deputy Surveyor, Bruce Rothnie used his optional Presentment slot to discuss Stream Restoration’s potential benefits and impacts on fish. There have been some presentments made in this Court raising concerns about the impacts of the stream restoration work on fish. Fish are a vital part of the ecology of the Forest and we all want to know that their surroundings are in a condition where they can thrive. In many places across the Forest the streams have the natural diversity of conditions that are good for fish – gravel riffles, pools, and vegetation in the water and along the bank. The stream life is in harmony with the natural processes of the site and robust to weather variations. Unfortunately in some places man’s intervention by straightening and deepening the streams has upset these natural processes and reduced the natural diversity upon which fish and other stream life depend. The straighter channels increase water flow which strips them of gravels, vegetation and the natural variation of water depth that is so vital for all stages of fish development. We all know that ponies grazing on the Forest need the freedom to roam in order to thrive. They can find shelter from hot or stormy weather; they can find water in ponds and streams; and they can exploit the range of vegetation at different places and at different times of year. Imagine if they were to be constrained to areas without this variation – their condition would quickly deteriorate. The same is true for fish and we have an opportunity through our stream restorations to re-establish the diversity. By restoring meandering streams we provide the physical conditions from which the natural processes can take over and the stream life can return at nature’s pace. These changes do not occur overnight and we have seen at sites restored in the past that benefits can show quickly but may take years to establish fully. Of course we are concerned about disturbing the existing fish populations during work. That is why we undertake fish surveys before work and then capture and relocate them downstream just prior to work starting – these techniques are widely used across the country and allow us to minimise the impacts on the existing population during work. After the work we are carrying out further surveys of fish and invertebrates at sample locations to see how quickly the stream life returns. I was talking with one of the people doing this monitoring work the other day and I was struck by his enthusiasm about the increasing numbers of fish and invertebrates he had been observing over successive visits – it’s early days but very encouraging. Concern has also been raised about higher water temperatures if scrub adjacent to the streams is removed and their shading effects lost. Often this scrub has established on the drier spoil banks created when streams were dredged. Removing this scrub allows us to flatten the spoil banks and permit the stream to flood out naturally during high flows onto the adjacent floodplain – a key part of restoring natural processes. This is important “surgery” before healing can take place. Water temperatures will vary and it is this variation in different parts of the stream and at different times of the year that is important for the survival of fish at all of their stages of development. The vital factor is that fish have opportunity to utilise the natural temperature variation created by pools and riffles and the vegetation in the stream. So by restoring this physical diversity we also restore the natural temperature variations that we also seek. All restoration schemes are planned and executed to minimise the impacts on wildlife. The measure of success of these schemes will come with evidence of their condition over time once nature has responded to the physical changes. Anyone left in doubt that these transformations are beneficial should visit some of the earliest sites on the Forest restored in the early 2000s – their condition is impressive and certainly more in character with the Forest we all know and love. This is part of the NFA’s initiative to publicise good works on the Forest. Presentments by the Deputy Surveyor ordinarily do not enter the public record until the minutes of the whole Court, including the in camera sessions, are approved at the subsequent month’s sitting, unless directly reported by the local papers. Those opposed to some of the wetland/river restorations have floated some theories suggesting detrimental impacts for fish. The Brown Trout observed spawning in a restored section of Harvestslade Bottom, three months after the works were completed, clearly didn’t get their memo. At September’s Verderers Court, in his Announcements and Decisions, the Official Verderer, Dominic May, spoke of a recent successfully prosecuted dog attack, and affirmed the rules for length and relevance of Presentments to the Court. On April 21st, two bull mastiff dogs, owned by a visitor to Holland’s Wood Campsite, chased and viciously attacked a Shetland pony. The pony was chased so far from the campsite that she was not found until the next day. At first it was hoped she could be saved, but due to the severity of the injuries inflicted by the dogs, a vet recommended that she should be destroyed. The owner of the dogs, Thomas Allen from Slough, was successfully prosecuted and has been fined £1,000 and ordered to pay £884 compensation to the pony’s owner and costs of £250. Hollands Wood camp site, New Forest. We are very grateful to the staff at the campsite, to Forestry Commission Keeper Jonathan Cook, and to the police, for their actions and evidence which resulted in this successful prosecution. We also thank the campers and staff at Holland’s Wood for their brave efforts in trying to drive off the dogs. In doing so they undoubtedly risked being seriously injured themselves. One of the dogs suffered a broken nose as a result of being kicked during the incident. This successful prosecution sends a clear message to all dog owners that they must keep their animals under close control at all times when in the Forest. We have recently suffered some irrelevant or over-long presentments from the public, so please may I remind the Court of our rules. Presentments must be relevant, and should only address matters that are the responsibility of the Verderers or the Forestry Commission as set out in the various New Forest Acts and Forestry Acts, namely Conservation, Landscape, Governance, Management and Animal Health. Secondly, presentments must be brief: no longer than five minutes. Thirdly, presentments must be moderately phrased and free of any express or implied abuse. As chairman of the Court, I will stop any presentment from the public which is not relevant, brief or moderate. — used with permission with our thanks. Here is the dog attack as covered by the Daily Echo. Many visitors to the Forest do not take account of both the unpredictability of the Forest’s livestock, nor their own dogs facing their novelty. Even though you are your dogs are allowed off lead, that does not make it always appropriate. All are requested to have dogs under “close control” which may include use of the lead. The FC Byelaws state: “No person shall in or on the lands of the Commissioners:-…(xiv) permit a dog for which he is responsible to disturb, worry or chase any bird or animal or, on being requested by an officer of the Commissioners, fail to keep the dog on a leash;”. Here is the National Park’s page on the New Forest Dog Walking Code. It should be noted that an NFA representative swiftly tested the five minute limit on Presentments, and was duly cut short, as was one other presentment at Wednesday’s Court. On August 30th, The Friends of Latchmore issued a press release. It spoke of an independent review which would cause the Forestry Commission to immediately withdraw the planning application for the Latchmore Brook wetland restoration. It was all their Christmases come at once. It was a complete fabrication. Now, to be fair, it is possible, as we will see, that they were led up a garden path, rather than, as has often been the case, the leaders. Representatives of the Friends of Latchmore are pleased to learn that the Chief Executives of the Forestry Commission and Natural England have agreed that there will be a full and independent review of the wetland ‘restoration’ proposals in the New Forest National Park, including Latchmore Brook. The review is expected to begin towards the end of this year as soon as suitable experts can be appointed. We now know that, apart from the first nine words, this is untrue. It then decends into a series of flights of fancy “Forestry Commission and Natural England officials are relieved at the decision, due to the range of complaints…” and “the Forestry Commission is expected to withdraw the Latchmore planning application”. Then crows a “Spokesperson for Friends of Latchmore said “We are absolutely delighted with the announcement” “. The alarm bells already ringing became a klaxon. Much of what had already been said was out of character, to say the least, with what we knew about the resolute intentions of the Forestry Commission to see the planning application through. But a reaction to an “announcement”? What announcement? There had been no announcement. It appeared that FoL had published their “Press Release” with absolutely no corroboration. Cue, half a day of tail chasing, FC and NE internally, and many of us on the outside trying to determine a) if there was a shred of truth to this b) where these notions originated. We confirmed that it wasn’t true, there had been no announcement, and that the rumour would be addressed by the Deputy Surveyor at the Consultative Panel. At the 1st September, New Forest Consultative Panel, Steve Avery, Executive Director Strategy and Planning for the National Park when asked about the alleged withdrawal of the planning application by the FC, “That hasn’t reached me, or my authority. We have a live planning application that we will proceed to determine until told otherwise.” The Deputy Surveyor, Bruce Rothnie categorically denied any intention of withdrawing the planning application or knowledge of an independent review. BR: There’s been a degree of misunderstanding, misinformation that has put out in the last few days and I want to clarify the position. We remain fully committed to Latchmore Brook Restoration Project and believe the current planning process is the appropriate way to deliver that. Some of you will remember that some time ago, and certainly before I returned to the Forest, it was agreed that this should be handled through the planning process because of the democratic process it brings. And that we volunteered to produce an Environmental Impact Assessment which was not required but we felt responded to the concerns of communities around us. Now we’ve completed that and it is our intention to see that process through. I have no information to me that there have been any discussions of chief executives coming down to me. I’m intrigued as to where you got that information. I have certainly not been able to find any other information provided, down to this level, about that, so perhaps you could explain wherever that’s come from. FoL: The information came from the top of Natural England. The press release was “passed”. It was understood that there was to be a joint statement today from the Forestry Commission and Natural England, that there would be a review. There’s obviously some confusion somewhere. I’ve no idea quite how why what’s occurred there, but that’s where the information has come from. BR: Through what channels …? FoL: Board of Natural England. BR: And how was that released to you, your knowledge? FoL: Through somebody that is in touch with them, and released through the environmentalist that’s been advising them, which I gather Steve’s had a letter from telling him all about it. So I was a little bit surprised that Steve said he didn’t know anything about it so there’s obviously confusion. Let’s say that. I can say no more, that’s the information I’ve had. SA: In the last week, out of 283 representations we received, one of them was from a gentleman called Tom Langton who referred to an imminent review of the scheme and withdrawal of the application, but it’s not grounded or sourced at all as to where that information has come from. The document is on our website, for everyone to see. But, like Bruce, I’d be interested to know where that information has come from, whether from the Forestry Commission or Natural England as alleged. Tom Langton is the Consulting Ecologist that the Friends of Latchmore hired for their “rapid review” (as we know, rapid is how all the best science is done). After the Consultative Panel closed, panel members speculated that it was possible that either Langton or the Friends of Latchmore had become confused about the review of the New Forest Wetland Management Plan 2006-2016. The New Forest Wetland Management Plan 2006-2016 published in April 2006, is (and was already at the time of these events) undergoing its end of term review. The big clue is in the “-2016”. The review is being done internally within Natural England with the participation of the Forestry Commission. The Management Plan is available on the New Forest HLS website. It’s difficult to conceive that the leaders of Friends of Latchmore would not be aware of this important document. In Tom Langton’s letter to the Planners he sites “threats to geological SSSI features and Odonata interests of international importance”, strange when you consider that the British Dragonfly Society (the Odonata in question) support the project. I think you may agree on reflection that, in any case, the need for a review in effect casts sufficient doubt over the Latchmore plans. It would be helpful if the application is withdrawn before this Friday 2nd September, the close of the consultation period. He doesn’t seem to be at any pains to explain how he reached his “understanding”, and at no point does he, in the words of Steve Avery, ground or source his statements. The actual review is a standard end of plan exercise, not caused by a negating “need”, and as it is a review of the work carried out under the management plan 2006-2016, it won’t include Latchmore as that hasn’t happened yet. His strangely presumptive sign off continues his baselessly strong suggestion that the application be withdrawn. On 17th of September, FoL issued a further press release which attempted, poorly, to reconcile statements, allegedly from the statutory bodies. Strangely it shows that they don’t know the difference between an independent review (denied) and an internal assessment (confirmed). They seem to be happy that the fact the word “review” was used at all somehow corroborates their original fantasy. The Lymington Times of 17th September published a story that partially continued to credit the refuted press release, and the Salisbury Journal ran an article which quoted much of it word for word. The statements about the alleged agreement to an independent review between the Chief Execs of FC and NE, and the withdrawal of the planning application in the Friends of Latchmore 30th August 2016 press release are total fiction. The Forestry Commission had further denied the statements directly to the reporters from the Lymington Times and the Salisbury Journal before their deadlines for the pieces that ran anyway erroneously continuing to credit those statements. Over 140 wetland restorations have been undertaken in the New Forest since 1997. Ongoing reviews of evidence, experience and lessons learnt are an integral part of any long term nature conservation project such as this. During the past 12 months, Natural England has been working on an Assessment of the evidence supporting wetland restoration projects in the New Forest. The Chief Executives of the Forestry Commission and Natural England recently agreed to prioritise finalising this Assessment. The next stage for the Assessment is an independent peer review through Natural England’s Science Advisory Committee. The objective is to ensure that the evidence and justification for wetland restorations reflect the most recent developments and that any gaps in our knowledge are identified. The draft Assessment has been authored by Natural England staff, including a Senior Freshwater Ecologist and Senior Wetland Specialist. Scoping and commission of the peer review is about to commence and we expect it to be completed during October. Once completed, the Assessment will be published on the Natural England Access to Evidence website. Unfortunately this leaves us with some speculation as to how they arrived at this, it looks like Tom Langton may have heard about the existing review of the wetland management plan, put two and two together and came up with five. Then either he potted it up as truth which he presented to his one time masters who embraced it as a dream come true, or passed it on as rumour which the leaders of FoL felt no compunction in passing off, uncorroborated as truth. Even had an independent review been in the offing, would the leaders of FoL have been happy with any result that didn’t go their way? As far as we can tell, this project has received more scrutiny than any other project of its kind. The voluntarily done Environmental Impact Assessment shows the planning authority how well the application fits the required criteria. The leaders of the FoL won’t be happy with anything except stopping the project. What’s so dangerous about either of the speculative scenarios is that they both point up the leaders of the Friends of Latchmore “special” relationship with the truth. We’re used to their lack of fact checking, their disproportionate elevating of minor issues into cause célèbre, and general hyperbole that sadly obscures the few valid points they may raise. We have, and will continue to point these out here and elsewhere. But this feels like new territory, releasing uncorroborated rumours as Press Releases, with their usual unearned authoritative tone, and even after public denial, getting two local media outlets to swallow this guff. That’s steering towards the land of fabrication. That brings us onto a third possibility. They intentionally cooked this up with their lackey Langton, to press for what didn’t already exist, and perhaps lead everyone on a merry chase. Are they that calculating, canny? So you judge, Rumour, Wishful Thinking, or Utter Fiction? The Friends of Latchmore have created a Crowdjustice crowd funding page to fund future legal challenges to the restoration project at Latchmore Brook. It contains some of their most problematic statements to date. The Crowdjustice site have told me that they do nothing to verify any case promoted through their “platform”, that this is entirely up to the claimants and their legal representatives. Some of these mistakes might be forgiven in a neophyte, but the authors of these pronouncements have been dogmatically stating their version of this case for several years, clearly having time and motivation to properly research, so we must take some of these as wilful misrepresentations. Given that their page is asking people to donate money to their cause, I should hope that the more sensible leaders of the Friends of Latchmore ought to feel a little bit queasy over these inaccuracies, which could lead to allegations of a scam. While we don’t believe there is malicious intent, even the possibly unintentional errors have the feel of those grasping at straws for virtually anything that supports their case, whilst systematically ignoring everything that doesn’t. We leave it up to you, dear reader, to decide how innocent these mistakes are. The Forestry Commission, New Forest NPA and the Verderers are spending EU money infilling Forest streams and destroying protected wildlife. The Verderers of the New Forest, The National Park Authority and the Forestry Commission have formed a partnership and obtained significant funding running into millions of pounds from the EU to ‘Restore’ wetlands under the Higher Level Stewardship Scheme which is an Agricultural subsidy meant to help British farmers(1), The partners described the whole New Forest National Park as a ‘farm’ in order to claim this money(2) but it has turned into a massive engineering project infilling many streams with waste products(3) in a misguided attempt to restore them, despite their having a wonderful biodiverse habitat supporting many of our rarest and most protected wild species(4). (1) The Higher Level Stewardship Scheme is an Environmental subsidy, the key give away is the word Stewardship which indicates a range of Environmental Stewardship programmes. Entry Level Schemes include subsidy to farmers laying hedgerows, or planting wild flowers beneficial to wildlife on fallow fields. (2) The partners would not need to describe the National Park as a “farm”. The HLS is eligible to both farmers and land managers. Common land is eligible. The HLS Scheme for the New Forest only applies within the perambulation of the common land, and so does not include the whole National Park. DEFRA does occasionally treat the New Forest Common lands as one unit, but this is for things like the Single Farm payment scheme (an actual Agricultural subsidy) and to make the cattle movement rules practical for commoning (movement restrictions which apply elsewhere to prevent spread of TB and other vectors would cripple the relative freedom of the cattle on the commons and their movement back to nearby free holdings). (3) “Waste products” – this is an utter misrepresentation – the materials for infill include hoggin, washed gravel, clay and heather bales. The materials used must be approved by Natural England. Elsewhere the FoL refer to the material as “alien”, the gravel is taken from the same geological strata (on earth) as that on which the New Forest rests. If we’re being charitable (why shouldn’t we be? ), they may have taken the term “rejects” as applied to some of the gravel. This refers to gravel not pretty enough to be sold in garden centres, but perfectly beautiful enough to be used for infill. This tabloid culture of infill shaming must be stopped. (4) The project is being done at the behest of and with the approval of Natural England. The Forestry Commission as the land managers of the New Forest SSSI are obligated to remedy the Condition Assessment prescribed by Natural England, part of their duties to monitor and protect SSSI. Natural England are then asked to give consent to the proposed solution, there is no guarantee of this as the proposal must pass another set of criteria on top of addressing the underlying problem. Natural England support the project. (5) The National Park Authority, Verderers and Forestry Commission are only “partners” in the project inasmuch as they are the statutory bodies required to be on the project board, and only benefits the Park as it successfully fulfils their statutory purposes “to conserve and enhance the natural beauty, wildlife and cultural heritage of the area”. The NPA is represented on the board by their Chief Exec Alison Barnes. The NPA’s Planning Committee is made up of 14 of the 22 members of the Park Authority. The Committee is mostly local Parish, Town, District and County Councillors (12) and 2 Secretary of State Appointees (through DEFRA). As with any Planning Authority they have strict criteria they must adhere to, and whilst they may seek advice from the civil servant staff of the Authority including their own ecologists and the Chief Exec, the decisions are theirs. No previous scheme has been refused because, like the present one, they are worthwhile restorations to improve the habitat, and have met the criteria for planning approval. There is no conflict of interest as the Chief Exec on the board of the project serves the members of the Authority, not the other way around. The Forestry Commission still uses the same methods for each new project despite substantial evidence of serious adverse effects(6) on the biodiversity of large areas caused by previous failed restoration attempts(7). (6) They do not have substantial evidence, in fact, in this short a time after the completion of previous projects, results are promising, but there is no substantial amount of data, which would require years of monitoring to support claims. An encouraging independent study by the River Restoration Centre and Jonathan Cox Associates, The New Forest Wetland Restoration Review, surveyed post restoration sites from 2004. (7) This is one of the laziest and unsubstantiated claims, none of these are considered failed. Where they claim restorations are failed they provide no evidence or relevant criteria to make this claim. The best they seem to be able to do, is to take photos of a dry stream bed before the project has finished bedding in and ignore that this is not its constant or eventual state. Not to mention that Ditchend Brook is situated in a valley where streams notoriously run dry in Summer (oh, we did mention that). It’s not just the fragile ecosystem which is at risk, but there are also precious archaeological sites(8) as well as significant geological areas, not to mention the serious knock-on effect the works will have on tourism and local businesses as well as the lives of local residents – massive tipper lorries each carrying in excess of 30 tonnes of material will be driving down narrow Forest lanes(9), putting the lives of the ponies and cattle at risk(10), as well as walkers, horse riders and cyclists, not to mention the potential for structural damage to properties(11) adjacent to the planned routes. 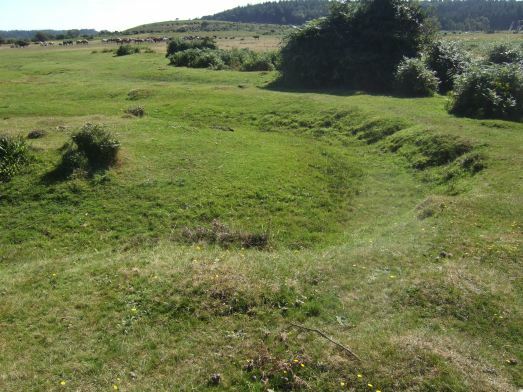 (8) The New Forest History and Archaeology Group have raised issues with the archaeological survey conducted to support the Environmental Impact Assessment. We believe these concerns may be mitigated and rectified, and we would support all interested parties to achieve this. (9) Slight error, the tipper lorries proposed have a maximum load of 20 tonnes. Odd though, as if their weird claim were true, it would mean at least 33% fewer HGV movements. (10) The same drivers will be used, and will be made aware of the “possible pedestrians, cyclists and livestock in the carriageway”, there will be “speed restrictions for delivery vehicles;” – 15mph on the Forest’s gravel tracks, 5mph under the ordinary 20mph restriction under the byelaws, and “traffic management with radios on the Ogdens route” as well as term time restrictions for school run to local schools. Consider the number of large scale refurbishments to properties along the route, which would have had none of these extra precautions taken for their HGV movements, and no protest over these. (11) Vibration study was carried out as part of EIA. (12) This quite vocal campaign group is in his constituency. His views about protecting the Forest though are inconsistent. In early 2011 at the time of Env. Minister Caroline Spelman’s disastrous proposal to sell off the public forests, only one of the two New Forest Conservative MPs (plus one from nearby Romsey) rebelled against their party. It was Rt Hon Dr Julian Lewis, not Desmond who opposed the sell off. mount significant legal challenges and if necessary to support a possible Judicial Review. We hope to challenge the legality of whole scheme and require the Authorities to put a stop to interference with balanced ecosystems (13) on this massive scale. (13) The ecosystem is not balanced, it was broken when Victorian engineers diverted the watercourse away from the natural meanders into artificial straight drains. The project seeks to undo this damage to bring balance back to the ecosystem of the area. (14) Clearly the author does not understand the difference between fact and unsubstantiated conjecture. The New Forest Association has been following the progress of stream restoration work done by the Forestry Commission carefully over the years. The Association backed the first of these projects in 2005 with some trepidation. Confidence has grown as the results came through and management techniques evolved. The work has been carried out sympathetically and has done much to enhance the overall environment for the long term. Our ecologists agree with Natural England that these works should help restore these precious habitats to “favourable” condition. We are delighted with the results of similar completed restorations, we are enthusiastic in our support for this proposal. We join our support to that of the Hampshire and IOW Wildlife Trust, Ringwood Natural History Society, and the British Dragonfly Society, amongst others. Natural England do condition assessments on Sites of Special Scientific Interest (SSSI). They found that for many of those sites in “unfavourable” condition on the Forest, a contributing factor was previous drainage works (many Victorian). As the Land Manager of the Crown Lands of the New Forest, the Forestry Commission is obliged to improve units in adverse condition. The programme of wetland restoration was seen as the best response to the condition assessment. The latest tranche of these is being done through the High Level Stewardship Scheme which is part of the wider Environmental Stewardship subsidies (from the EU). These projects are controlled by a project Board whose voting members are the statutory bodies with responsibilities for the Crown Lands: The National Park Authority, the Forestry Commission and the Verderers of the New Forest. Consultation on versions of the scheme at Latchmore has been going on since 2009. Along the way, the proposal was expanded to include all the areas in the stream catchment above Latchmore so that all the project areas that would be needed for eventual success could be rolled into one larger Planning Application. Making the application that size has also meant extra due diligence including a voluntary Environmental Impact Assessment, and extensive consultation. The project will decrease flood risk downstream. An elementary understanding of hydrology would tell you that taking a straightened Victorian drain, and replacing it with curving meanders will slow down the egress of water from the system. Birmingham and So’ton Uni’s used the river catchment upstream of Brockenhurst, where previous restorations under the HLS, Final 4000 and LIFE3 programs have been completed over the last decade, for a study showing “flooding alleviated by targeted tree planting and river restoration”. We have no doubt that the “Friends of Latchmore” and their supporters love the Forest. However, their leaders have waged a one-sided campaign full of scaremongering unsubstantiated claims of ecological disaster. This is strong emotive stuff, if we took what they say at face value, we’d join their barricades, but their black and white view of the matter stifles debate and cheats their followers of the full view of the facts. They don’t even try to discount the great support from ecologists and conservation organizations, they ignore it, and they certainly don’t mention it to their followers. Nor will they concede the great successes of previously completed restorations. They have the gall to selectively quote, on their website, the British Dragonfly Society, who support the project. Not that they don’t have valid points to make, but they bury them under a white noise of hyperbole, and irrelevancies. Instead of making points constructively and proportionately, they, in their clutching at straws manner, nitpick any small mistake with previous restorations as though it were a thorough refutation. These are the kind of minor notes the NFA and others would simply press upon the FC to add to their maintenance program. There is one stream, Ditchend Brook, which had work completed in 2014, which hasn’t bedded in as quickly as some of the other projects (which, frankly have bedded in much more quickly than expected). When particularly dry, there is a stretch that the FoL like to photograph and parade as a “failed restoration” (although they offer no criteria for this “failure”), they are seemingly alarmed by the large stone cobbles (which replicate the type of substrate found here, and are less likely to be washed downstream) . The FoL are fond of suggesting that the Planning Authority cannot be impartial as the National Park is also a “partner” in the project. Their assertion cynically relies on oversimplification and ignorance. The National Park Authority is only a “partner” in the project inasmuch as it is one of the statutory bodies required to be on the project board, and only benefits from the project as it successfully fulfills the Park’s statutory purposes “to conserve and enhance the natural beauty, wildlife and cultural heritage of the area”. The NPA is represented on the board by their Chief Exec Alison Barnes. The NPA’s Planning Committee is made up of 14 of the 22 members of the Park Authority. The Committee is mostly local Parish, Town, District and County Councillors (12) and 2 Secretary of State Appointees (through DEFRA). As with any Planning Authority they have strict criteria they must adhere to, and whilst they may seek advice from the civil servant staff of the Authority including their own ecologists and the Chief Exec, the decisions are theirs. No previous scheme has been refused because, like the present one, they are worthwhile restorations to improve the habitat. There is no conflict of interest as the Chief Exec on the board of the project serves the members of the Authority, not the other way around. Does the NFA uncritically support these Wetland Restorations? No. Nor do we unreservedly support all of the Forestry Commission’s plans. For example, we are currently challenging the FC to have a serious rethink of their current version of the proposed Forest Design Plan, and we just successfully campaigned for the FC to tighten their regulation of fungi foraging on the New Forest SSSI. We continue to campaign for better monitoring both by the Forestry Commission and Natural England which would make the case on paper for this and future restorations much more cut and dried. We may have preferred a more strategic prioritization of restorations (admittedly this could easily have been a tail chasing money burning exercise with little net benefit). We seriously note concerns raised by the New Forest Equestrian Association : road safety and transport of materials, and New Forest History and Archaeology Group : inaccuracies and omissions in the archaeological report, but believe these may be mitigated and rectified, and the Planning Authority and applicants should work with all interested parties to achieve this. With any new scheme it is accepted that there will be some disruption in the immediate vicinity. Much of the scrub clearance would have been carried out as part of normal open Forest work for Commoning pasture management. This work compliments ancient lawn maintenance and adds to biodiversity. The area will recover quickly and be a better place for wildlife and the stream will meander across the lawn as it did once before. On balance, we have concluded that this project is worthwhile and should be approved. If you are on the fence about support for this project, we hope that you will avail yourself of information (see further reading below). But, if you’d prefer to ponder this over a pleasant walk, we’d suggest you go and walk the Warwickslade Cutting, near Rhinefield Drive. The restoration on this stretch was completed in 2009. It was proposed and funded under the Final 4000, a project between the Forestry Commission, the National Park Authority, Natural England and the Environment Agency. It was done with the approval of the Verderers and with no opposition from the Commoners Defence Association (keep in mind that this project did not include any subsidy to benefit either). When you walk the stream at Warwickslade, you will be hard pressed to even imagine that work was done there, the only indication of the original straight channel you may glimpse is a gap in the canopy of the trees that were once either side. This is a mere seven years later, but it already looked this good five years ago. You may also want to go walk the Latchmore Brook itself. The original meanders are still very apparent, although the Victorians cut the throat of their source to convert the Brook to a drain. In the photo at the top of this note you’ll see part of the meander to the left of the current course. It’s edged by an area of parched grass to the left that would likely be green improved grazing if the meander were in place and functioning with its floodplain. Imagine a stream gently flowing through the middle of the picture on the right, consider whether that harms, improves or equals the beauty we have now. Finally, please consider this: The Victorian Engineers who put in the drainage works did not do Environmental Impact Assessments, they did not use sensitive methods of moving stream beds aside, so that invertebrates and other features of the habitat could be preserved, as done in the restorations we have now. Spoil heaps were left willy-nilly, conditions for erosion and bank instability were created, and the stream was disconnected from its natural flood plain. Despite the bullishly done works of our forebears, these areas have bounced back. Nature is resilient. We need look further than our own lifetimes, both to the future and the past. If this work does not go forward, it will be a missed opportunity to provide an ecosystem more resilient to change, and to restore landscape and habitat. Going forward the NFA hope we can all hold the Forestry Commission up to the highest standards for implementation, monitoring and maintenance of this work. Warwickslade project for comparison: a mix of 8,000 tonnes of hoggin (dug sand and gravel mix) and 800 tonnes of firm clay by-product, both sourced locally, for 2km stretch, at a cost of £214,500. Error: Error validating access token: Session has expired on Sunday, 10-Mar-19 01:16:56 PST. The current time is Wednesday, 24-Apr-19 23:32:59 PDT.